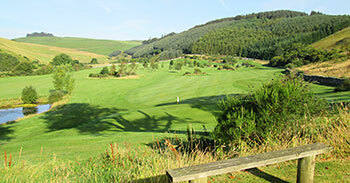 Designed by local professional Alex Cleghorn, the course at Woll Golf Club started out as a 9-hole affair when it first opened for play in 1993. New owners took over eight years later and they immediately resolved to expand the course to a full 18-hole layout. By 2004, the additional nine was in use, with the old holes at 3 to 9 re-sequenced as the new 12 to 18. The reconfigured course now measures just over 6,000 yards from the back tees, playing to a par of 70, with three par fives – two of them played back-to-back at the 12th and 13th – and five par threes on the scorecard. The club decided to upgrade its greens to USGA standard in 2014 and began this process on six of the original holes. The par threes are all feature holes, with ponds in play at the 133-yard 5th and 166-yard 17th. “Hare’s Back” at the 8th and “Roman Cundy,” the downhill 11th, are both pleasing on the eye but the best of the short holes is the 155-yard 15th (“Saddle”), playing to an elevated green that’s protected by a couple of bunkers to the front of the putting surface. The first is a fine short par four opening hole, dog legging left to make good use of a burn that runs in front of the green. I liked the 2-tier green on holes 4 and 7 though, on the latter, I can’t for the life of me understand why anybody would want a forward pin placement on a putting surface that runs sharply away from front to back. The pace really picks up on the back nine, even though most of the holes are set out on flatter terrain. I award holes a score of up to 3 points when playing a course for the first time and the total for the last seven holes was exactly double what I’d marked for the preceding eleven holes. The green on the par five 13th is nicely contoured, the right doglegged 14th is a terrific short par four and the slightly uphill short par three 15th is possibly the signature hole on the card. I’m not sure the new pond in front of the 17th green was necessary and it still looks a little rough around the edges but that will surely improve over time. The course is obviously still evolving after a couple of decades in operation and it’ll be in better shape when all the greens have been converted to USGA specifications. It’s obvious the club is trying to improve both the on course playing experience and the off course clubhouse facilities so top marks to Woll for investing in the future when others are maybe struggling to do so.